Science of the Saints, 5-I-2019 (23 Dec.) The Holy Ten Martyrs of Crete. 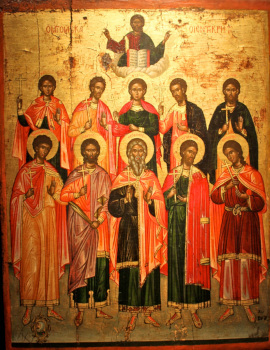 The Ten Holy Martyrs of Crete: Theodulus, Satorninus, Euporus, Gelasius, Eunician, Zoticus, Pompius, Agathopus, Basilides and Evarestus suffered for Christ during the third century under the emperor Decius (249-251). The governor of Crete, named Decius just like the emperor, fiercely persecuted the Cretan Church. One time there were brought before him ten Christians from various cities of Crete, who at the trial steadfastly confessed their faith in Christ and refused to worship idols. Over the course of thirty days they were subjected to cruel tortures, and with the help of God they all persevered, glorifying God. Before their death they prayed that the Lord would enlighten their torturers with the light of the true faith. All the saints were beheaded. Previous Previous post: Science of the Saints, 4-I-2019 (22 Dec.) The Holy Great Martyr Anastasia. Next Next post: Science of the Saints, 6-I-2019 (24 Dec.) The Holy Great Martyress Eugenia.